5 Year Property Transaction History Now Here! We’ve heard the feedback! 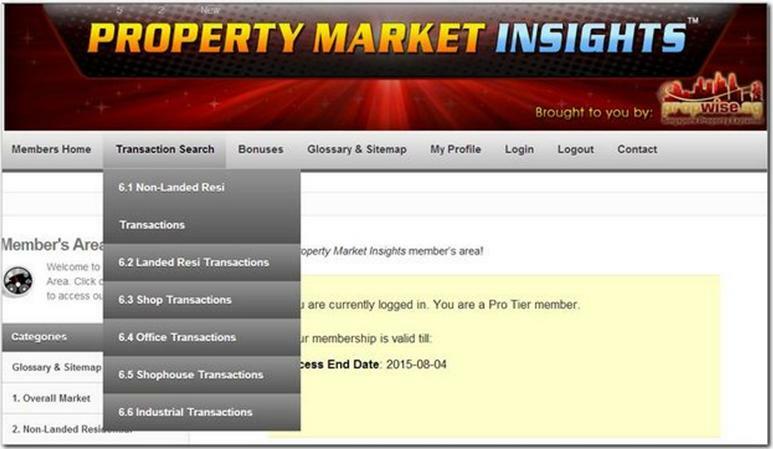 We are glad to announce our 5 Year Transaction History pages, the #1 requested feature by members of PropertyMarketInsights.com, a leading web-based research and analysis membership site that covers all segments of the Singapore property market. Basically what our members get is a regularly updated and searchable database of residential (non-landed and landed), commercial (shop, office and shophouse) and industrial transactions. This feature is much more powerful than many of the other tools out there. For example, when you check transactions at URA’s website, it does NOT reveal the exact floor or unit of the property sold. If you were trying to compare a unit on a low floor facing the garbage dump versus one on a high floor with sea view, would the prices be different? You bet! And if you’re interested in commercial or industrial property, there’s nothing similar out there that we’re aware of. Once you’re logged in, PMI members will be able to access the transaction pages via the menu bar at the top of your screen (see screenshot below). All members can access the non-landed residential transactions page, only Premium and Pro members can access the landed residential page, and only Pro members can access the Shop, Office, Shophouse and Industrial transactions pages. Don’t have a membership yet? Get one now. Want to track transactions in a particular project? Let’s say you’re interested in a particular project, for example “Bayshore Park”. Just type that into the Search box to get all the units that have transacted in the last five years. It’s a great way to get to see both the volume and pricing history of transactions for any project you’re interested in. Want to know how much the seller paid for his property? One of the extremely helpful uses of this page is to find out what price and when the particular unit you are interested in was last transacted at. For example, let’s say you’re interested in unit #09-11 at The Sail, and the seller is asking for $1.5 million for it. When negotiating on the price, wouldn’t it be useful to know what price the seller paid for it, and when he or she bought it? To do so, just head to the “6.1 Non-Landed Residential Transactions Search” page and type in “the sail” in the Project Name box and “09-11” in the Address box and click Search. When you do so you’ll find out that the seller bought the apartment in January 2011 for $1.27 million. Knowing this, and assuming the seller is not financially stressed (i.e. forced to sell because he desperately needs the money), you know that his minimum “transactable” price is likely around $1.3 million, because below that, he will be losing money. 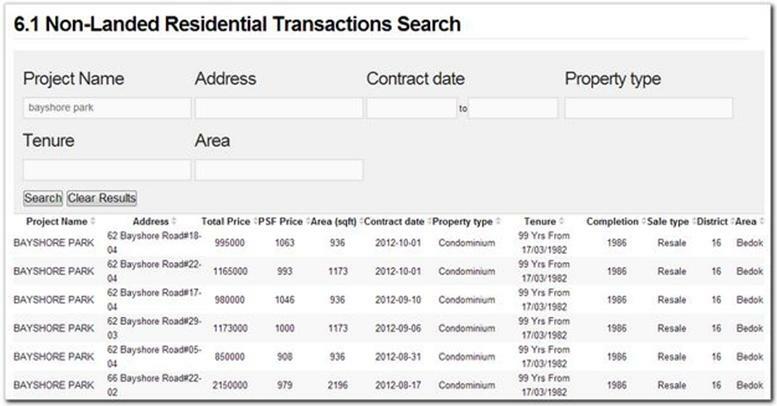 If you’re in the market to buy or sell a residential, commercial or industrial property, the 5 Year Transaction History pages are indispensable tools for any serious property investors. At least for those who don’t want to lose money J Try it out now at PropertyMarketInsights.com. PreviousPrevious post: Do the Additional Stamp Duties and HDB Cash Over Valuation Make Sense?